This was followed by BMW stating that it too was not averse to sharing its own battery technology, that it had jointly developed with Samsung. There were other developments, like Tesla’s decision to set up a large factory in Nevada to manufacture Lithium batteries in partnership with Panasonic. Toyota, who partnered with Tesla for battery-electric powertrains in 2010, have decided to let their agreement lapse at the end of this year. Toyota has decided to focus on fuel cell vehicles. The above developments prompted us to examine the patent landscape of the electric vehicle industry. We took a closer look at Tesla’s patent portfolio and compared it to the patent holdings of the other major players – which include both the large automakers as well as battery manufacturers. Battery and charging patents constitute about 60% of Tesla’s patent portfolio. This is clearly an R&D focus for them. Tesla is a new player in the EV industry with a fairly modest patent portfolio compared to the various incumbents. Tesla was established in 2003 and introduced its first model, the Roadster, in 2006. It’s earliest patent filing dates back to 2006 as well. 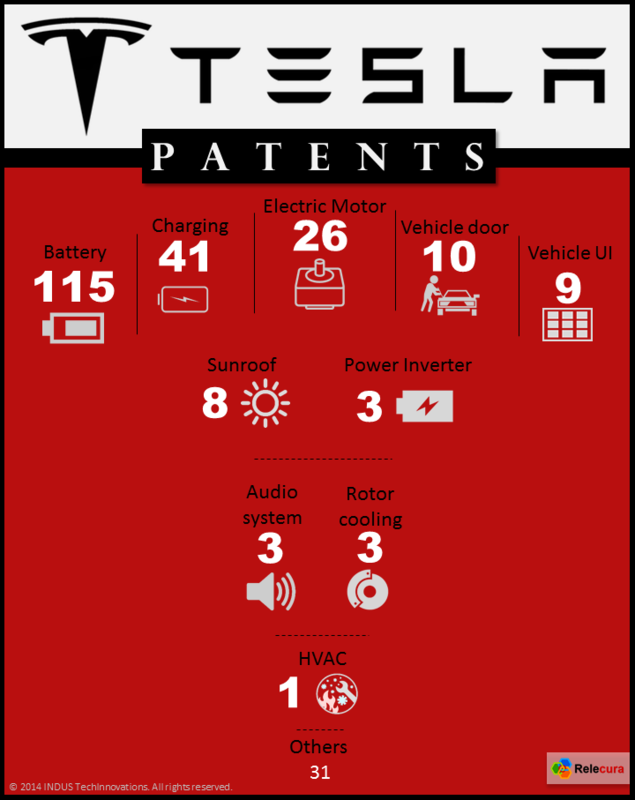 Notwithstanding this fact, Tesla holds significant IP in EV battery and charging technologies. Our findings are presented in our new IP Intelligence Report [Press Release]. The analysis was done using Relecura, our patent and portfolio analysis platform. This report is free and is available here [PDF]. We have collected a fair amount of patent data during the course of this study. If you have a specific interest in data about a particular company or technology area related to EVs, let us know. We will be happy to share the data with you. Remember to check out our earlier reports, which can be downloaded here.